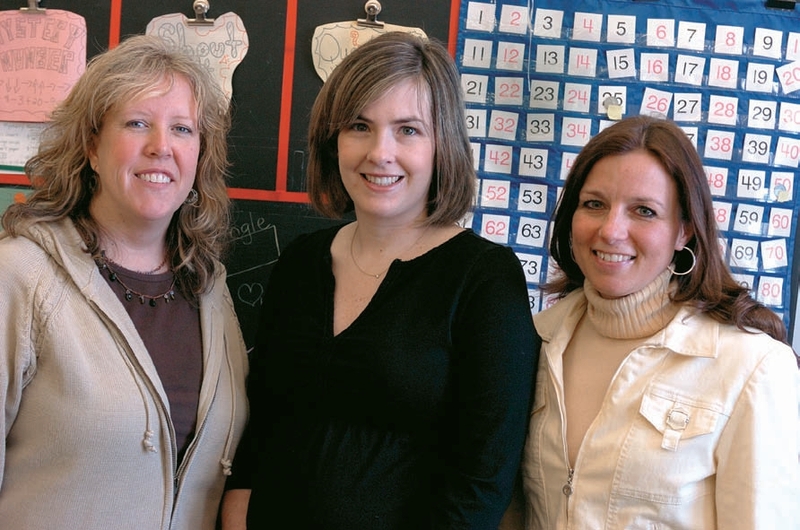 Seventeen years ago two new teachers, Deb Zeagman and Deb Pitblado, discovered that they would be working together as a grade team at Pinegrove Public School in the Halton District School Board. Since then we have changed schools, had babies, and raised our families. But the team is still together. Along the way, a third colleague, Katy Kelly, joined us. This article is our reﬂection about why working as a grade team is a special opportunity that provides a unique kind of professional development. Many teachers arrive at school, go to their classroom, work with their students, brieﬂy chat with other teachers at the photocopier or in the staffroom, go home after school, plan and mark on their own, and go back and do the same thing the next day. Working as a grade team can look and sound much different. Our classrooms are side by side. When we arrive in the morning, we often greet each other with a new story, share a laugh, or maybe a last-minute lesson if one of us is in need. We may discuss and get advice on something that happened the day before. When the students arrive, we greet them together and begin our day. The students know, respect, and listen to each of us because they see us working together every day. We are a team of teachers and our students see themselves as a team of learners. We have an innovative arrangement. This year Deb Zeagman teaches grade 2, Deb Pitblado teaches grade 1, and Katy Kelly teaches grade 2/3. However, over the years we have rotated through the Primary grades, sometimes teaching the same grade, and have taken turns teaching a combined grade if needed. As a result, we understand the different grades and Primary students, and we can support each other more effectively. Every day we build on each other’s ideas. We reﬂect on what works, revise, try things out, and watch how someone else teaches a lesson. If it was successful – great. If not, we analyze, modify, and change it before trying it in our own classroom. This year we have our lowest class numbers ever, with 17, 21 and 20 students. This makes it easier to combine classes into one room, either two or all three, as appropriate. We use this arrangement when all of our students are going to be participating in similar activities (for example, art lessons, math centre activities, science videos). Only one of us is needed to describe or give the instructions for the activity, while the others are freed up to do a variety of tasks: preparing materials for upcoming lessons, doing one-on-one assessments with students; working with smaller groups to explain a modiﬁed version of the activity (enriched or remediated); or watching our colleague teach and providing help, when requested, with classroom management or with modelling the activity being explained. We have created a safe environment that takes into account difference: if we think that something we are discussing as a team will not ﬁt into our classroom, we feel comfortable enough to opt out. We share everything from our resources to our parent volunteers, who work for all three classrooms. Each of us photocopies for all three classrooms. For us, teamwork cuts down on our workload and reduces stress. Between us, we have 40 years of experience, problem solving, and wisdom. Our programs, interactions with students and parents, and outlook on teaching are enhanced through our approach. As Peter Senge says in The Fifth Discipline: The Art and Practice of the LearningOrganization, “When teams are truly learning, not only are they producing extraordinary results, but the individual members are growing more rapidly than could have occurred otherwise.” As a group we are able to grow more rapidly and share that learning with others who may not be in similar circumstances. We have taught ETFO Summer Academy courses together, facilitated ministry training together, and modelled programs for other school teams. We have been successful because we work as a team. To continue our personal growth, and to keep up with best teaching practices, we select a speciﬁc topic or learning strategy to focus on. We analyze that area together and determine what we want to change. We may go to different professional development experiences on that subject area. Together we make connections, think about what we already do and what the research says works best, and then determine how to make it work in our environment, with our students. Each of us decides what will work best for our grade level, and as a team we ensure that the activities the students are involved in are developed to suit their individual grade expectations. Administrators past and present have recognized and appreciated the time and energy we put into our team planning. They have provided common planning times and adjacent classrooms, and have scheduled shared duties when possible. They have also supported initiatives that we bring to school council; they encourage us when we want to attend the same workshop and provide coverage if we are participating in a special initiative or event. Kilbride Public School is our third school together. We have purposely followed each other here. We sought this opportunity out because we recognize the value in working and being together. We feel that we deliver our program three times more effectively than we would if we were on our own. Our collaboration beneﬁts students and parents. Our working arrangement didn’t happen overnight, it happened over years. We learned and grew together, one bit at a time. At the beginning, we planned together over lunches and a working dinner once a month, and during our common planning times. This ensured that our programs and approaches worked together. We began with simple things, picking one small piece to develop and work on together each term and each year. It could be as simple as working on an activity for a new picture book, creating a set of math centres, or planning a new unit. If you are currently working on a team but not as a team, approach someone and ask if she or he would be interested in working on something together. If sharing your love of teaching, your desire to learn, and your workload sounds appealing, then try the bit-by-bit approach. Start with a smaller focus and gradually try to incorporate a more collaborative approach to your teaching environment. The best learning takes place when teachers walk into someone else’s classroom. The three of us are lucky enough to walk into each other’s classrooms every day. 1 M. Schmoker, “No Turning Back: The Ironclad Case for Professional Learning Communities,” in On Common Ground The Power of Professional Learning Communities. R. Dufour et al (eds. ), Bloomington, IN: National Education Service, 2005. 141.